Road cycling has long been a popular past-time in Italy, indeed along with France and Belgium, Italy dominated the competitive road racing landscape in the early years. Undoubtedly Italy produced great cyclists but the country also led the way in driving technological innovation in racing bikes throughout the 20th century, think Colnago, Bianchi and De Rosa. Tuscany is the heart of Italian road cycling and you can push yourselves on the roads from Florence to Siena or Florence to Montepulciano. Test yourself in a country that is steeped in road cycling heritage, famous for the rolling hills and winding ascents. 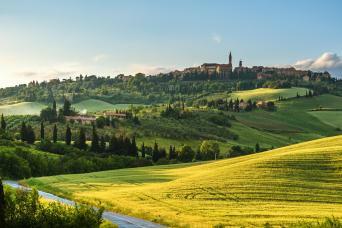 Ride from Florence to Siena through the heart of Tuscany’s Chianti postcard-perfect wine region. 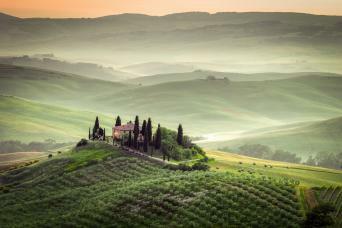 Take on our Tour of Tuscany cycling from Florence, through the world-class winelands of Chianti and Montepulciano.